All Rooms are to be connected on a Single Set of Two Cables. No need to Lay 50 Cables for 50 Rooms or 80 Cables for 80 Rooms. 5. Reduced number of items makes it eazy to maintain. 1. Master Unit: This unit will be installed in Director/Administrator/Principal Room. Master unit consists of Mic, speaker and 16X2 character menu driven LCD display. PS2 keyboard to instruct the system in user friendly manner. 2. Slave Unit: These units will be installed in classrooms / Labs / Staff rooms / Activity Rooms / Department Cabins etc. It consists of speaker and Mic. 3. Power Supply: One Linear supply unit is sufficient to connect 10 slave units. 1. Master unit is connected in parallel with all the slave units on a set of two cables. 2.1. One to one two way communication can be performed with any selected room. Voice of administrator will be heard only in selected room, no other room will hear the conversation. 2.2. Group Calling: Administrator can make 05 groups of 10 Rooms each to make group announcements. Groups can be made of Rooms with common interest. 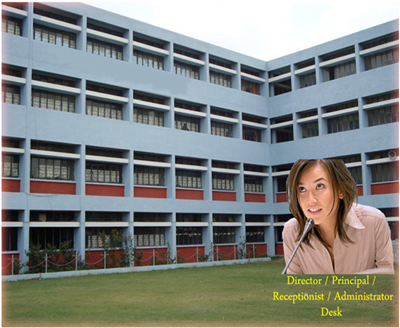 Like the announcements for all the admin staff is mostly common, for all the sections of senior secondary classes is mostly common and likewise. Groups can be easily selected using F1-F5 function keys on PS2 Keyboard. 2.3. Other than Making groups Administrator can make group announcements directly by entering room numbers. They can be any random rooms having common interest. 2.4. All Call: Administrator can perform ALL CALL. During ALL CALL the voice / announcement from administrator will be audible in every room where slave unit is installed. This can be used to announce any information bearing common interest for all. 2.5. 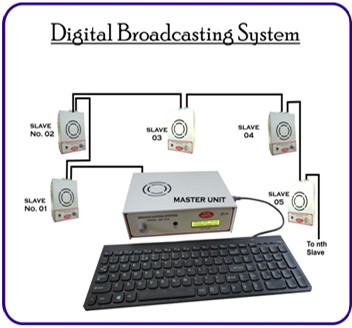 CD / DVD Player, Computer, Mobile or any audio device can be connected with master unit to play music or any prerecorded message. 2.6. This whole system can also be used as building’s local audio broadcast system like radio/FM works for whole city. Schools can add an extracurricular activity to their routine for students and give them opportunity to show case there hidden talents through their voiceovers, daily news telecasts, singing, musical instrument playing etc. This will definitely inculcate confidence in them. Sweet music can be played during office hours in corporate offices / Malls etc just to let their employees feel relaxed and energized. The whole system is running only on a set of two cables so it is very easy to maintain comparing to traditional system, no efforts are required in this system to manage and maintain a huge bunch of cables. Asks for less space in Administrators cabin. No need to put huge control panels on Administrator’s table.